Kudos Import Luxury is fully aware of the sheer quality and attention to detail packing into each and every BMW vehicle. We’re intimately familiar with how you feel about your car, and how powerful the admiration for your vehicle can be. This is why we offer full service to BMWs in the St. Charles area with the goal of maintaining that same level of precision and making your BMW feel as good as brand new as you peel off, take those tight turns and push your engine with the faint hum you know so well. In fact, it’s hard to not admire the BMW brand for all its years serving the European and American public. It’s a brand steeped in history and it’s as colorful and characteristic as every one of their distinguished designs is. While the R23, the brand’s first motorcycle and first entire vehicle (instead of a just a precision-focused engine,) was impressive BMW wasn’t done expanding. Their sight turned next to the idea of a vehicle, a versatile car. Their first official car production reached the market in 1932 and it was called the BMW 3/15. Soon after, the BMW perfected the model with the BMW 303 a better car, with a remarkable straight six-engine. Soon after BMW would throw a broad net over convertibles, coupes, and sedan models too. 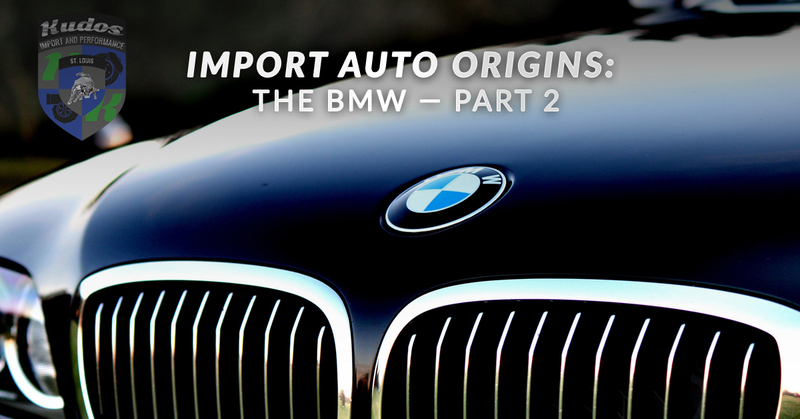 BMW started setting itself aside as a luxury import vehicle brand early on, but they had a couple of models that stand out in the eyes of history. In the 1960s, BMW was not doing terribly well financially. Rather than lay down and take the financial bombardments until they went out of business, BMW grew more innovative. They saw a gap in the market in the way of large sedans and spent their last bit of stockholder money creating something to fill that gap: the New Class. It was a landmark set of large sedans, of both luxury and compact coupes. Shortly after, their true landmark line dubbed “the New Six” which included the well known, 7 Series, 6 Series, and 3 Series was released in the image of the New Class. Once safely out of financial dire straits, the brand was equipped to experiment in more exciting ways, specifically bringing in harvesting the fruits of their years of labor and creating the iconic E30 M3. This two-door sports car was one of the most richly awarded car models of all time. Its outstanding performance remains a testament to the quality of a BMW. In 2002, BMW started turbo-charging many of their vehicles which inspired lines like the BMW i8 which is known for its nearly Italian sports car appearance and extremely powerful engine. If your BMW makes that daily commute a bit less tiresome, then it’s worth every penny. Keep your BMW, a car that’s backed by years of experiences and incredible feats of innovation is not just a car, it’s an evolution from the past to today. Keep your beautiful BMW vehicle in tip-top shape at Kudos Luxury Import. We specialize in keeping your precision vehicle working the same way that it did when you drove it off the lot. Contact us if you have any questions or concerns about the continued maintenance schedule for your pride and joy.